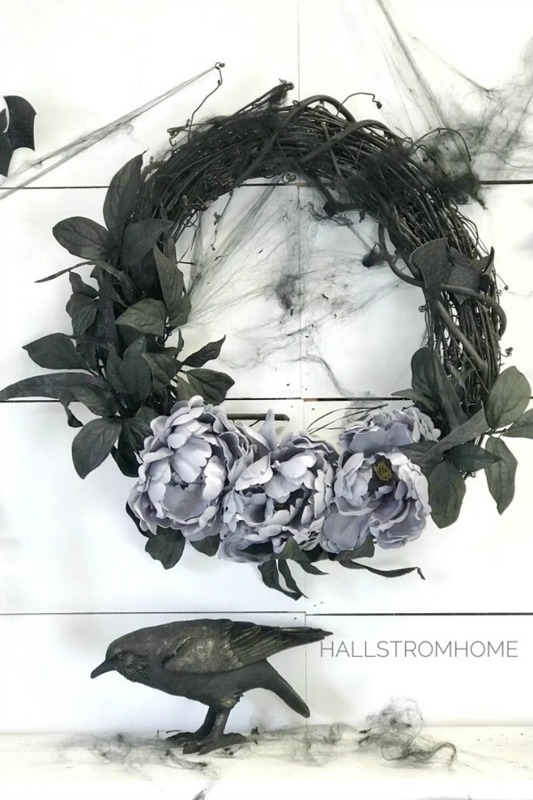 To get started on your #1 Halloween Wreath that’s Easy Elegant and Beautiful, I would purchase a grapevine wreath. The fun part is, you’re going to spray paint this black. Now if you don’t like spray paint or don’t have a place to do it, you can also chalk paint it. Either way it turns out fabulous! This Halloween wreath will let you decorate your home for your Halloween party to the trick or treat front door. I painted both the front and the back of the grapevine wreath. I also painted the leaves and branches black, to give it a better Halloween look. You can purchase black leaves and black flowers, but at the time of year I was creating this they weren’t available. So, I went ahead and painted mine. 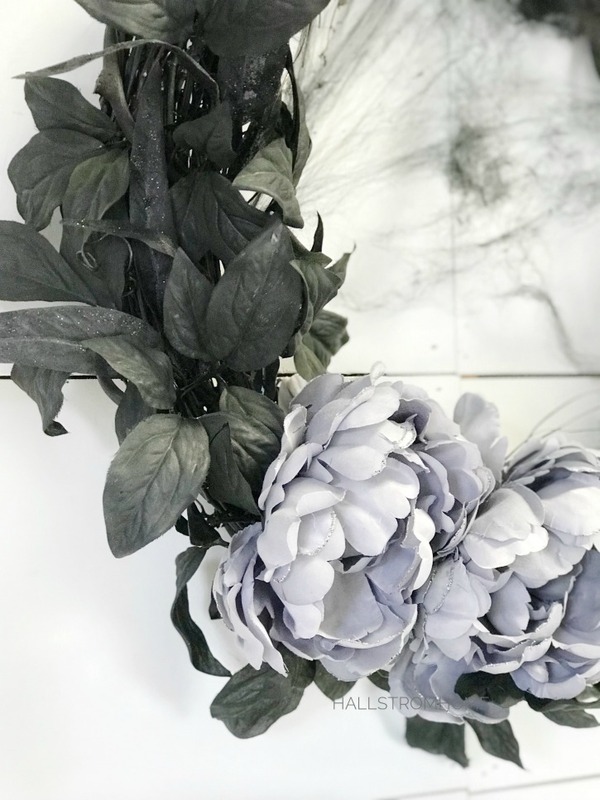 Using a hot glue to glue is what works best, that’s what I did on my flowers and leaves. You can stick them in the wreath but to secure it better, use hot glue. See those elegant candelabras? 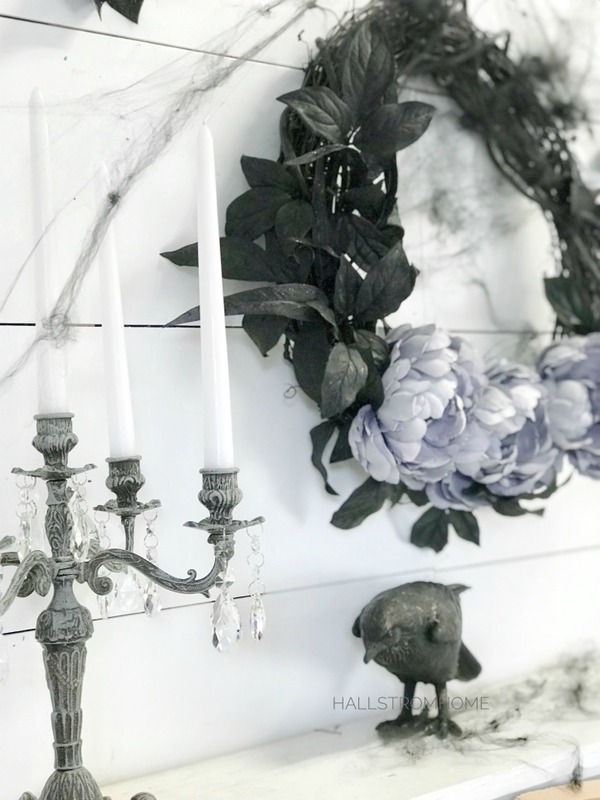 Yeah you can find the candelabras in my shop! To layer your wreath, you’re going to cut your stems down a little bit. There’s really no set pattern so that’s one of the things about wreath making, you can get really creative. The only thing I tried not to do was to get too matchey patchy. Doing one side a little bit heavier with the leaves and the other side just slightly less worked great. I then placed my flowers right in the center of the wreath, I hope that makes sense! These flowers came with glitter on them, but you can add glitter by using the spray glitter. I’ve used it on candle holders before and it works great! 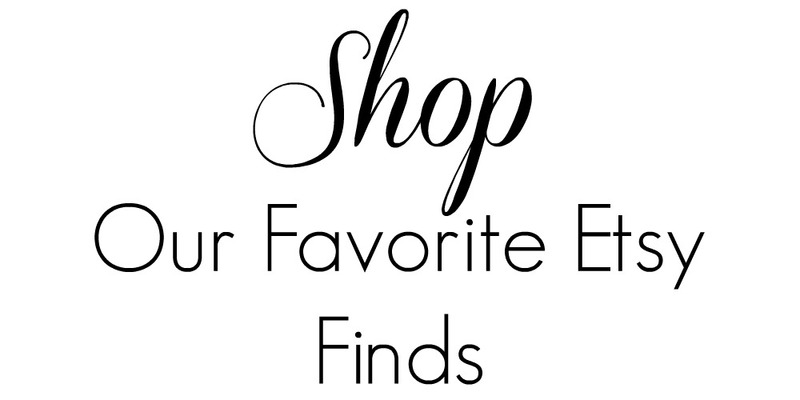 Shop below our Halloween finds from Etsy. Making wreaths can be so much fun! Any season, any way you want it to be. 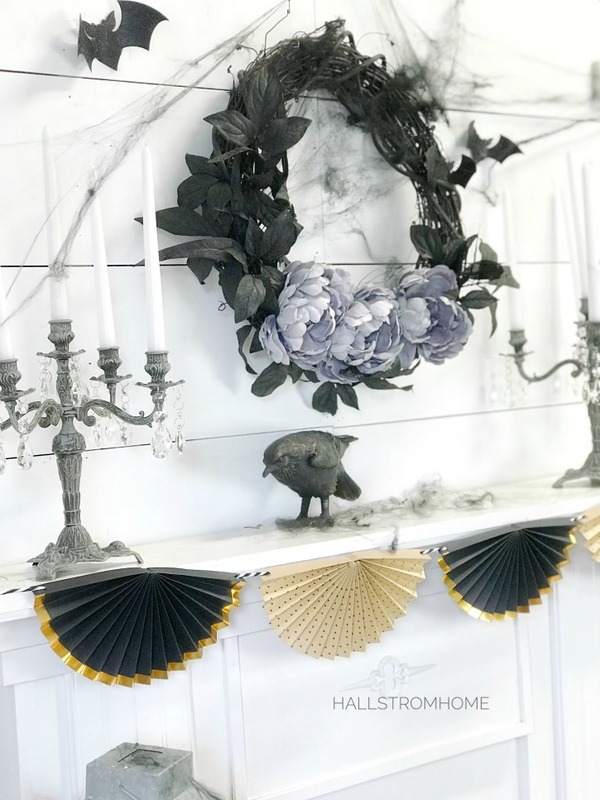 Customizing your own wreath is a blast and lets out your creativity! I would love to see what you can come up with, tag me on your Instagram @hallstromhome. 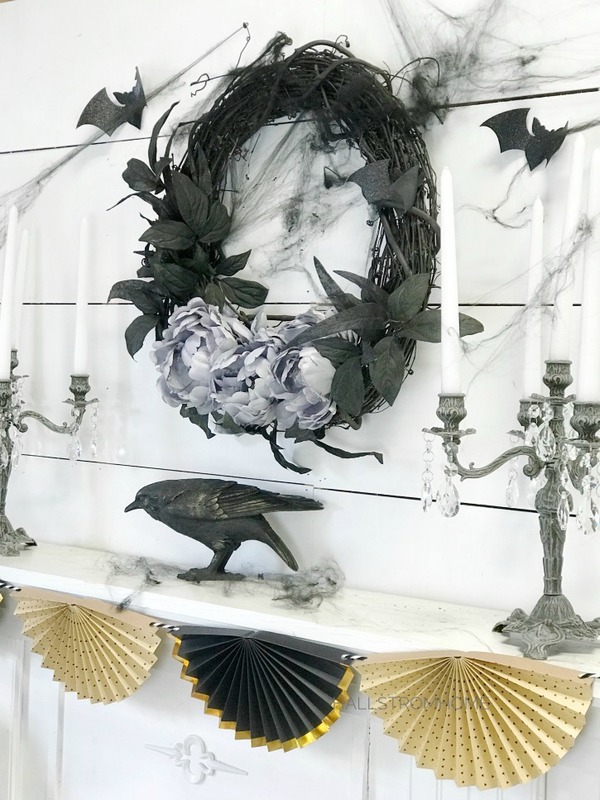 This wreath is my favourite Halloween wreath that I’ve seen this year! I love that it’s spooky and pretty! I love how this is so elegant and creepy. Great wreath! This is beautiful and spooky at the same time, Rhonda. I love it! I love a good wreath project. Thanks for sharing and those candlesticks are beautiful. Glad you could be a part of the Halloween Hop! Thank you and thanks for hosting! You always do a wonderful job! I love the way this looks on your mantle!! Grapevine wreaths are just so versatile. I love all the touches of glitter! 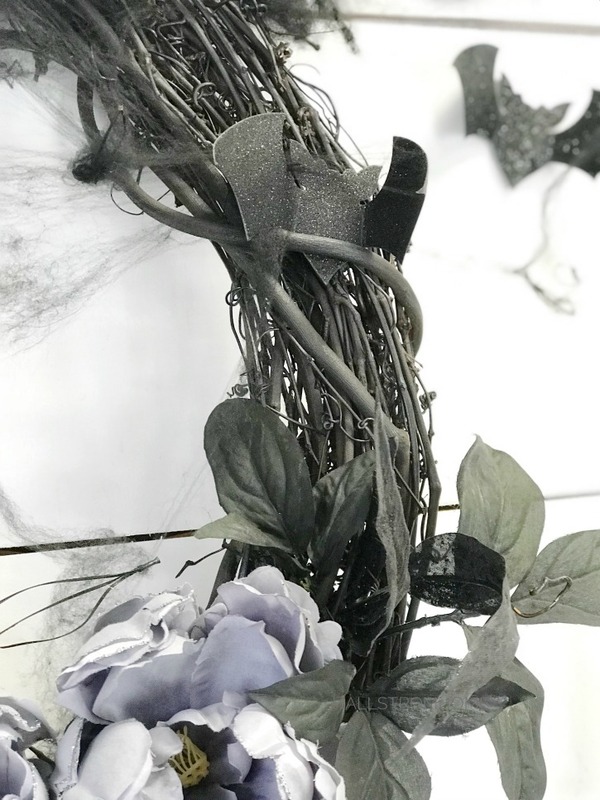 That’s a classy Halloween wreath…you are so crafty!! Love it! !